This past Saturday was the first EdCamp Louisiana and it was amazing! 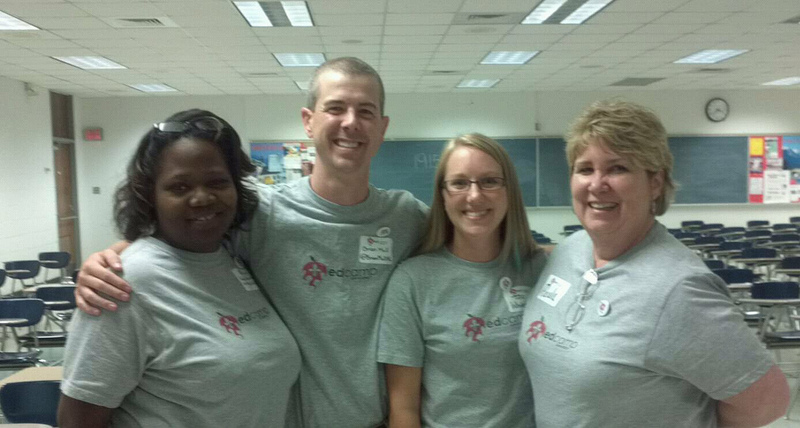 The photo above was taken afterwards of 4 of the 5 organizers – Valerie Burton, Brian Mull, myself, and Paula Naugle. We waited too long to take the picture, so we are missing Carl Gaines. It really was a wonderful day and so many great conversations took place. There’s nothing better than being around inspiring, passionate educators and it was a bonus that these peeps are local! I led a session on digital storytelling tools, which was really fun. One of my gems of the day was meeting and talking to Tinashe Blanchet — for me she’s one of those people that you just connect with and feel that they are a kindred soul. I adore her – she’s cute and loves all things cute, I mean come on!! She’s doing awesome things in her classroom and shared some great resources, including Canvas, a learning management system that I’m very interested to learn more about. She also shared in a great session on QR Codes, which I definitely plan to dive into this school year. The most AWESOME thing about EdCamp was getting to meet such great people that are so close by. ISTE is amazing, but when I leave, I’m sad because we disburse throughout the country. Here I realized that we have a concentration of awesomeness in our state and we need to harness that and band together! We need experiences like this more often. EdCamp Louisiana…holla! Now get involved and go plan your own edcamp! Tiff’s ISTE11 Adventures – Tuesday, right? Yesterday was a busy and AWESOME day. I was able to record before I crashed – here it is! So I think I’m going to keep a vlog to update on here as the ISTE 2011 Conference approaches. I am so pumped. Here’s my first video — I’m talking my way through my conference schedule — SO PUMPED!!! Click here to access the Conference Planner, which is an AWESOME tool. So this has been in the works for quite a few months, but we are now at the point where we have a venue and can really start pushing out the word — we’re having edcamp Louisiana!!! I’m very excited to work with Valerie Burton, Paula Naugle, Brian Mull, and Carl Gaines in organizing this awesome event, which is the first of its kind in Louisiana! The big event is going down on July 9th at the University of New Orleans (we have a date AND a venue!). Paula has posted about edcamp Louisiana here, and Valerie has posted here. So of course I needed to do the same! Interested in attending? Know someone from Louisiana who you think would love to attend? Go here to register!